Yes you read correctly, the flying boat. 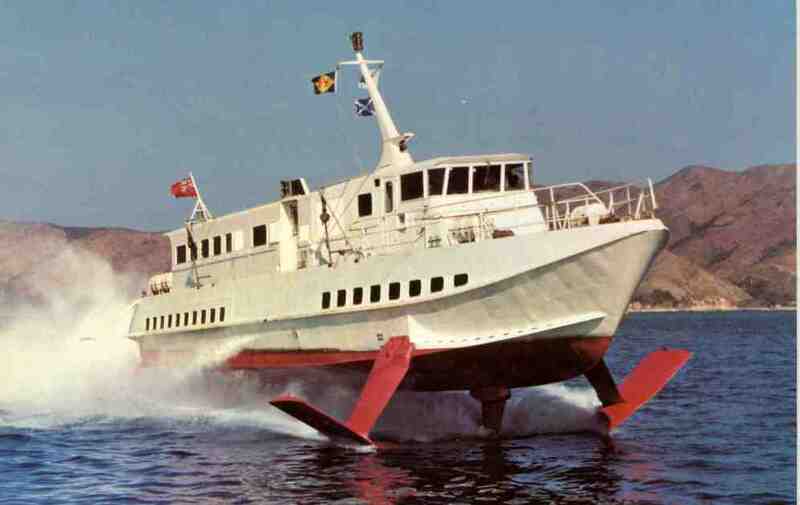 A hydrofoil is a term used to describe a watercraft whose hull is fitted underneath with foils (wings essentially) that produce lift to clear the hull from the water. The overall effect of this is reduction/elimination of the viscous and pressure effects on the hull which essentially means reduction in drag and allows a more efficient use of the craft’s propulsor allowing it to achieve higher speeds. So all that sounds like a bunch of mumbo jumbo, but I think this video will allow you to visualize exactly what I am talking about. At low speeds the outside of the hull and foils sit submerged underwater but as the craft speed increases, the foils create lift. The amount of lift the foils can create depends heavily on geometry and angle of attack (as mentioned in my previous post). In simplest terms, the velocity of water over the foil is faster above it than that below and this creates a pressure distribution that is different on the top and bottom surfaces of the foil. The figure below shows the typical pressure distribution for a cambered (unsymmetrc) airfoil. The lower pressure exists above the foil then below, therefore “lifts” in the direction of the lower air pressure. A more rigorous explanation of how lift is produced might come in a later post but for right now this basic explanation will suffice. Depending on the design of your hydrofoil, the angle of attack for the foil may be constant or variable but it will most likely be constant. With this in mind and using the basic lift equation, you can determine how much lift you can theoretically produce from your design given an operating velocity. Once this lift force is equal to the weight of the hull, crew, and cargo on your craft, voilà, the hull is lifted out of the water and you have a flying boat. Of course, there is definitely more complexity to the design but this gives you a basic idea of how a hydrofoil works. Hope this inspired some interest in a very cool, niche type of water craft. ← Robotic Glove Designed To Teach You To Draw!